Mr. R received quite a bit of birthday money from family and he knew exactly what he wanted to do with it.... Legos! 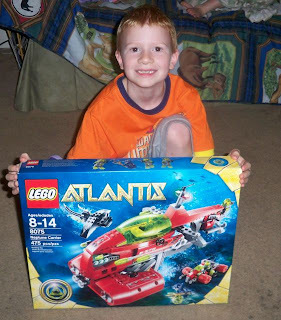 He had a good time looking on-line to see what his choices were and then he picked this Atlantis set. He had us order it from Amazon for him, once it arrived he disappeared for a couple of days to work on it in his free time! Oh, and since the box arrived at bed time....He slept with the box in his bed that night!